Be a part of the healthcare solution? No problem for PrimeImaging. This energetic and innovative group of ten physicians began in North Georgia over thirty years ago, expanded their practice to Chattanooga in 1996, and now operates three outpatient imaging facilities in the Chattanooga metro area. The past two decades have seen explosive growth in medical technology that speeds diagnosis, reduces treatment complications, and saves lives. At the same time, heathcare costs in the United States have risen at a faster rate than the costs of most other necessities. The past several years have also seen increased awareness of the potential downside of radiation exposure that goes along with computed tomography (CT scans), heart catheterizations, and other diagnostic studies that use X-rays. Cost and patient safety are two of the many factors that must be considered by conscientious radiologists thousands of times each day. The Hippocratic Oath provides the cornerstone of medical practice-First do no harm. It seems obvious that a doctor who causes unnecessary physical harm to patients would not be meeting the highest ethical standards of his or her profession. What about the doctor who frequently performs unnecessary or inappropriate diagnostic tests? PrimeImaging take their name seriously. As consultants to other physicians, they consider it their professional duty to provide fast, accurate interpretations of imaging studies and to recommend the test or tests that will answer the clinical questions most efficiently. The radiologists rely on decades of experience and established multi-specialty guidelines such as the American College of Radiology’s Appropriateness Criteria to support the kind of decision making that can improve outcomes and reduce costs at the same time. What further sets PrimeImaging apart from the competition is the unique combination of low-tech dedication to patient care, intelligent use of cutting-edge technology, and friendly, comforting environments at each of their facilities. Administrative Director Becky Ratchford emphasizes that “Every PrimeImaging employee is aware that patients are often in pain and feeling anxious or vulnerable when referred for a diagnostic imaging test. We passionately believe that our positive and supportive staff help patients and their families make it through difficult times.” On the high-tech side, PrimeImaging was the first to bring numerous diagnostic and minimally-invasive treatment innovations to the Chattanooga area, including full-field digital mammography at all locations, PET/CT, breast MRI and MRI-guided biopsy, catheter-guided thermal tumor ablation, and combination SPECT/CT Molecular Imaging. 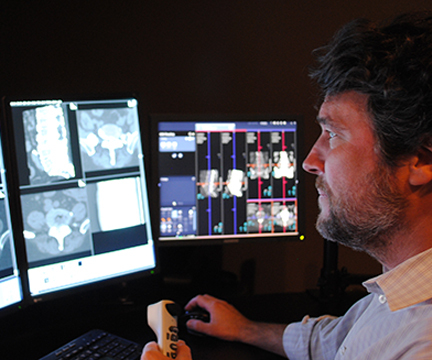 The technological framework supporting this growing radiology practice is nothing short of amazing. Since full-field digital mammography became viable in 2004, PrimeImaging has taken advantage of the many benefits of an all-digital practice. They routinely send massive amounts of image data across a network that interconnects all of their practice locations in Chattanooga and North Georgia. This allows sub-specialist radiologists with additional training (in neuroradiology, cancer imaging, or musculoskeletal imaging, for example) to instantly access and interprets exams in their areas of expertise that may have been performed on the other side of town.